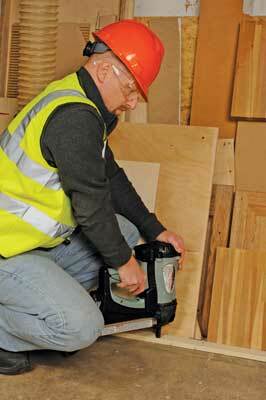 Whether you work on site or in a construction environment without compressed air on tap, for productivity, speed and operating comfort then a cordless gas nailer is 'de rigueur'. There are plenty of tradesmen who are still using an Estwing and a pouch full of wire nails when a gas nailer would do a much better job quicker. 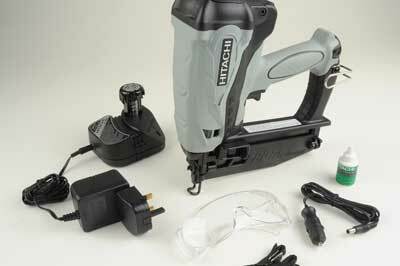 In common with many other manufacturers Hitachi have a comprehensive range to suit all needs. 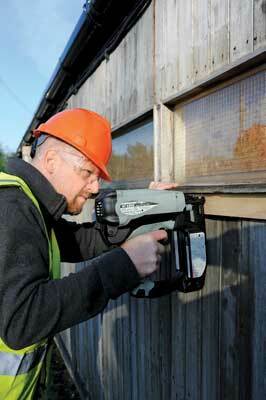 They range from the NC40G when you have challenging jobs that need timber rails fastened down to concrete through first-fix framing work in either discreet clipped head nail or round head versions and then finishing off with second-fix finish nailers in angled or straight body versions to suit access situations. 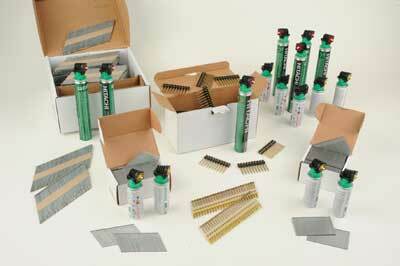 Hitachi supply a complete range of collated - strip - nails, and fuel cells - gas cartridges - with each consumables pack containing both, so you know you are ready to go when you collect your consumables from your local fixings dealer. 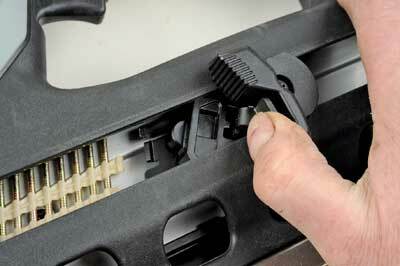 For anyone not used to these high tech tools, the principle is simple but the practice is little more involved. 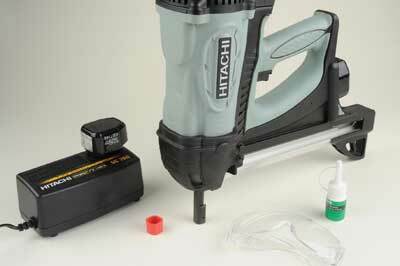 A fairly small battery pack provides the ignition for gas injected into a cylinder creating a small detonation that fires a piston which punches a nail into the timber. 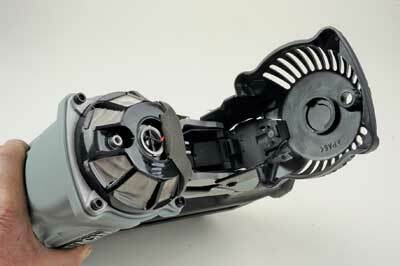 A small motor, fan and air filter are part of the operating system. 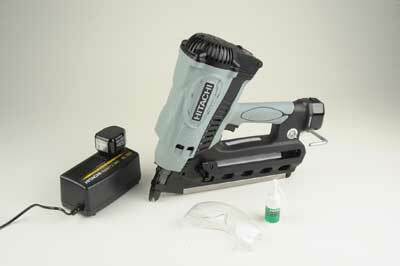 The internal nailer mechanism is quite sophisticated and tough in construction but needs regular maintenance, a clear instruction sheet with photographs shows how to disassemble and reassemble, clean and lubricate the tool. 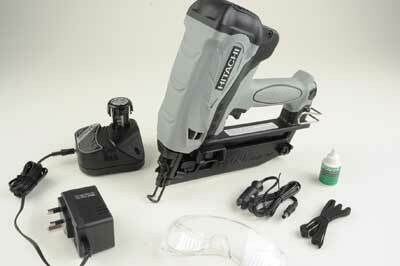 A troubleshooting list also shows how to use the each nailer correctly and to deal with problems like nails not bedding in properly or stoppages. It also warns about not using in low temperatures i.e. below 0ºC when the fuel won't gasify. Each tool comes in a large tough blow mould case with two batteries, a charger, lube oil, instructions and eye protection. 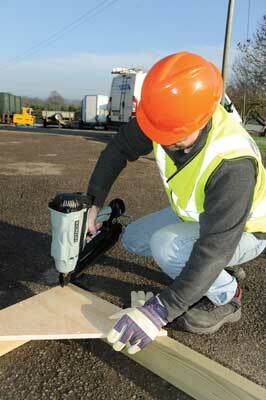 Ear defenders would be sensible too, especially in busy working environments. 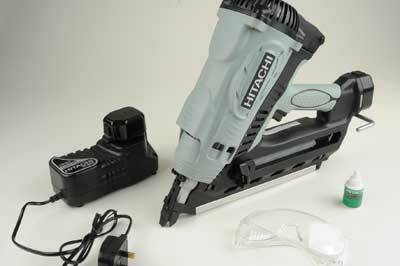 Safety is clearly an issue and Hitachi point out all the obvious hazard potentials; these machines are not toys and are capable of considerable damage if misused. Building sites often get quite crowded at second-fix stage when mixed trades are all working to a handover deadline so you have a right to expect a clear workspace if you are using a gas nailer and to avoid situations such as 'double firing', i.e. two operators, one either side of a stud wall as an example. Having said all that these tools are capable of a very high work rate so long as you allow the gas piston to reset and recharge with gas. Time is money and conventional means are tiring so adopting these nailers makes good sense with a fast return on your investment.